New to fishkeeping? This is the place to find out whatever you need to know! New here, having my first go at tropical tanks. Got a 55l tank with a 14W T8 lamp and a little fluval 2 filter. The plan is a low tech tank with a few plants in with low demands, any ideas on which ones? Would like small leaved plants to try and keep everything to scale with this being a small tank. What do you think so far? apologies for the poor picture, will try again later. Drained the tank tonight, took the sand out and gave it loads of rinsing to get rid of the clouding of the water, put it back to roughly 1" in depth and re arranged things, just conditioned and now getting the temp back up again. Using SafeStart with a fish-in cycle, going to add the first fish over the weekend to give things time to settle in. Any thoughts on suitable fish. I quite like swordtails and I think a bottom feeder would be cool, not sure what is best though. My LFS have been great so far so will keep you updated on what they recommend too. Nice set up with the grass and all. Couldn't tell you about the livebearers since I don't keep those. But a nice little shoal of cories can be exciting. They love to play in the currents and just wiggle their little tails. Do not add any bottom dwellers ie corys, yet as there is nothing for them to graze on. They are better in a fully cycled tank so leave them out for about 3 months at least. Swords and platys are nice, and you could cycle with a trio - 1 male and 2 females, or just have males if you don't want to end up being presented with new fry every 3 - 6 weeks. Cherry barbs would also be a good choice. The tank is looking very nice so far. Carylnz wrote: Danios are excellent to cycle with but no good if you do not want to keep them in the tank once it has cycled. why arent they good ? 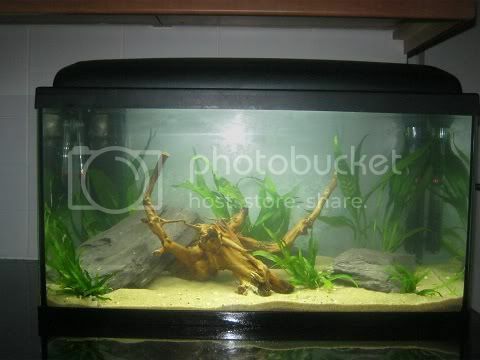 It is no good using danios to cycle if you then do not want to keep them in the tank. It means you have to find them a new home. I did not mean the danios themselves are no good - they are ideal, IF you are happy to have them as long term inhabitants. Thanks guys, will let you know what I end up getting. 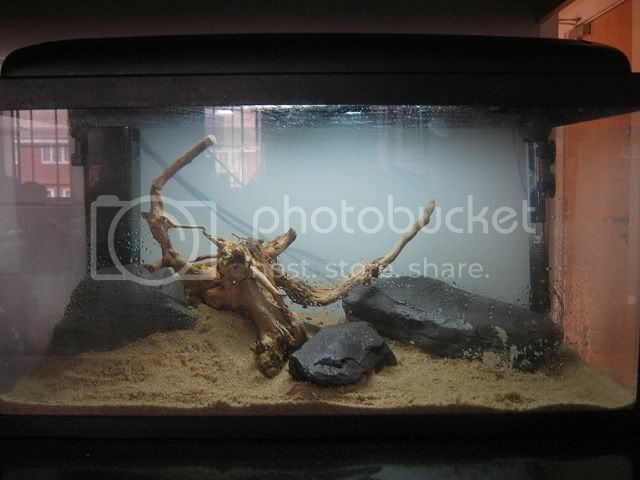 Will try a small shoal of something I think, maybe Danios or tetras.